"When people see this place, they ask why haven't we moved." 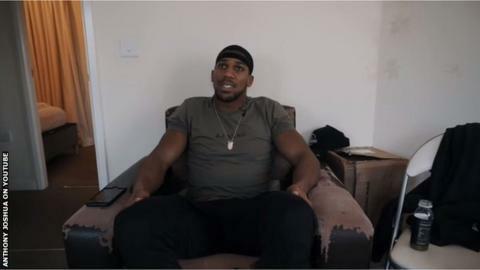 World heavyweight champion Anthony Joshua has posted an MTV Cribs-style tour of his flat on his YouTube channel - and the place is very, very basic. AJ, who remains undefeated, is training in Sheffield before his US debut against Jarrell 'Big Baby' Miller in New York on 1 June. And he wanted to show his fans where he lives while he's getting in shape for the big fight. The flat is located close to the GB Boxing base where he trains and is, to put it mildly, low key - a long way from the lifestyle you might have in mind for one of the world's biggest sports stars. But there's a telling phrase he repeats throughout the video: "It works." Joshua's flat tour starts with the living room, which features a very worn sofa and armchair, as well as a recovery chair he uses for physiotherapy. "You've probably noticed the vintage seats - we've had these seats in here for about the last seven years," he says. "They're comfortable, they work and I can relax." Vintage is one way of putting it. Next on the tour is the kitchen, where AJ shows off his electric hob and his fridge - which contains predominantly vegetables and different drinks to keep him hydrated. "Nothing too exciting but it works," says Joshua. "Unfortunately there is no champagne, no vodka, no Ciroc, just water, Supermalt and raw fruit juice." Joshua then opens the door through to the 'master bedroom', which includes what he describes as a "big single bed". It's bizarre to see the 6ft 6in AJ in such a tiny room, with nothing on the walls. It seems he's happy to have no distractions, and just concentrate on his next fight. "I can kick back after a long day, just think about my training, sparring, what I'm trying to achieve in and outside the ring... it's very quiet, not much goes on in here." Joshua then moves into his en suite bathroom, which features a window that allows him to "keep an eye on anything that's going down". "Sometimes you have to keep an eye on the streets and check nothing dodgy is happening," he says. "Make sure everything is in order. "I just come here and stand for hours making sure everything is smooth, nothing is going on and we're all protected." His neighbours will be certainly pleased to know they've got the heavyweight champ on neighbourhood watch. Next stop on the tour is the double bedroom, which overlooks the "lovely views" of the steel city. David Ghansa is a key member of AJ's team and lives with him in the flat while they're in camp. "While you're in here you can't hear anything. It's peaceful," he says. After a trip to the communal bathroom, Joshua moves back into the living room and sits on his battered armchair. "When people have come here and when people have seen this place, they do wonder why we haven't moved," he says. His answer? "Because it works." He adds: "It's peaceful, everyone has their own space, better sleeping, food to eat and it accommodates what we need for training. "And do you know what's brilliant about it? The gym is a two-minute roll down the hill... there's no excuses not to train so it's a perfect location." Joshua's humility is evident not only in the video but from fans' comments on the video. One user said: "Reminds me of the house I grew up in... and I hated it. AJ has just reminded me to be thankful and grateful in 3 mins﻿." Another said: "All those millions in the bank & you're living like that... my hat off to you AJ!" The humble digs might not be where you'd expect to find one of the world's biggest sports stars, but one thing's for sure... it definitely works.